We all know that if we want to keep our bodies fit and healthy then we have to exercise and keep our muscles in shape. So it isn't surprising that the same applies to our brains. If you want your thinking to stay sharp throughout life, and especially as you age, then get into the habit of pumping mental iron! What's the Best Way to Exercise Your Mind? There are lots of ways to work out your brain cells. If you want to get your body in shape, then it's sensible to choose the type of sport that you enjoy, and are likely to commit to in the long term. The same principle applies if you want to exercise your mind. The important point is that you should continually challenge yourself by learning new skills. You can learn a foreign language, play scrabble or bridge, learn to play a musical instrument, or join a painting or pottery class. You're most likely to stick with whatever brain training most appeals to your personal inclinations. Many of these activities also involve increased interactions with other people, which in itself provides mental stimulation. How Does Brain Training Build the Brain? Common conditions like Alzheimer's and Parkinson's are degenerative, incurable brain diseases, where connections and communication between brain cells deteriorates. To a lesser degree, the overall mental decline that comes with old age is due to similar processes. Brain training activities can help to keep the connections strong, and may help to keep older brain cells agile and less vulnerable to damage. Sometimes older people start to show mild cognitive impairment that can greatly impair their functioning even though it's not yet severe enough to be defined as Alzheimer's disease. It may progress to full blown dementia, or it may remain the same for many years without progression. Some geriatricians have developed brain training techniques that are simple, and not at all technological to help such people to cope with day to day forgetfulness. The patients used monthly pocket calendars, where every day was divided into scheduled events and tasks to be done, as well as anything else that they just kept forgetting. The study co-ordinators worked with the patients for six weeks so that use of the calendars became an automatic habit, not something that could be easily forgotten by the brain. They all found the system helpful, and their relatives all appreciated the fact that they were no longer having to answer the same question over and over. Indeed, the system may be attractive even to people who don't have any memory loss problems! How Important is Physical Fitness? Physical activity increases blood supply all around the body, and that includes the brain. There's research evidence that links physical activity to slower mental decline. It's even been suggested that the best possible thing is to combine physical exercise with exercising your mind, for example by choosing to learn a series of complex dance moves rather than sit on a stationary exercise bike. 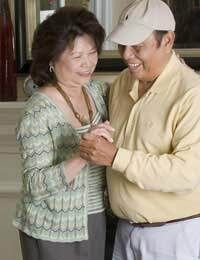 One study found that older men and women who learned to tango got measurable improvement in balance and memory, skills that might help to compensate for early signs of mental decline. They probably also had a lot of fun.